Image from Khmer Girls in Action. This Friday, the 4th Annual “Funhouse of Horrors” hosted by Khmer Girls in Action (KGA) will offer a haunted maze and escape room while educating attendees on how they can participate in shaping a more balanced budget for Long Beach youth and communities in need. 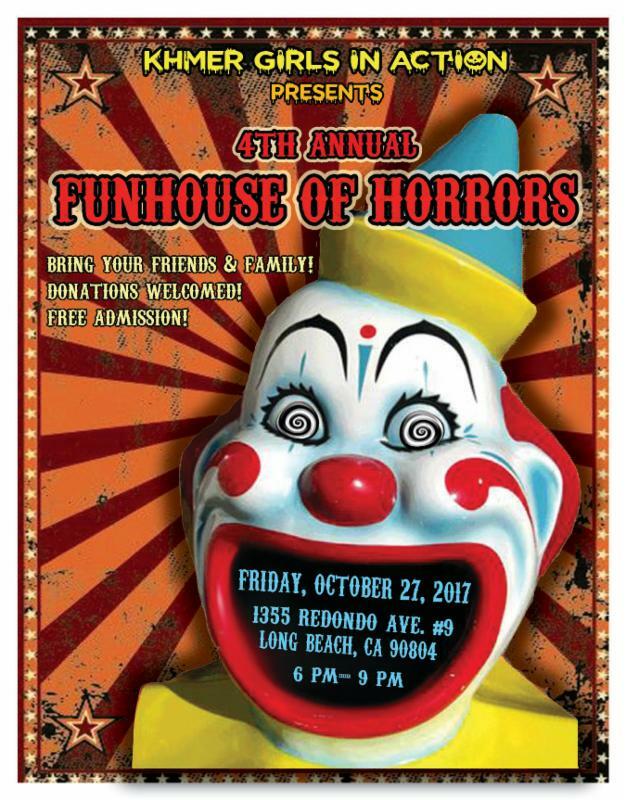 The funhouse will feature a costume contest, photo booths, puzzles, tricks and scares; both in the spirit of Halloween and in an effort to draw attention to “some very scary and real horrors haunting youth in Long Beach,” according to the announcement. Two of those horrors include that “out of $430 million from the general fund, only 5 percent goes toward youth development. According to the Advancement Project of California, 5 percent or $23.7 million, is obtained from the budget for libraries, parks and recreation, economic development and health services,” according to KGA. KGA is a grassroots organization started in 1997 whose mission is to develop youth leaders within the Southeast Asian community in Long Beach. The group also fights for gender, racial and economic justice. KGA will be handing out surveys on how to prioritize budget spending. The responses will help shape the platform for their joint campaign with Building Healthy Communities – Long Beach called “Invest in Youth”. You can also take the survey online here. Cities like San Francisco and New York recieve a youth development budget of $174 million and $562 million, while Long Beach only receives $23.7 million. That $23.7 million is derived from the budget from parks and recs, libraries, economic development and health services, according to research from Advancement Project California. Admission to the event is free but KGA will accept any donations. It will be held from 6:00PM to 9:00PM at the Khmer Girls in Action office located at 1355 Redondo Avenue, Suite 9.